These pictures show the progress photos of colouring a Fish fin from start to finish. 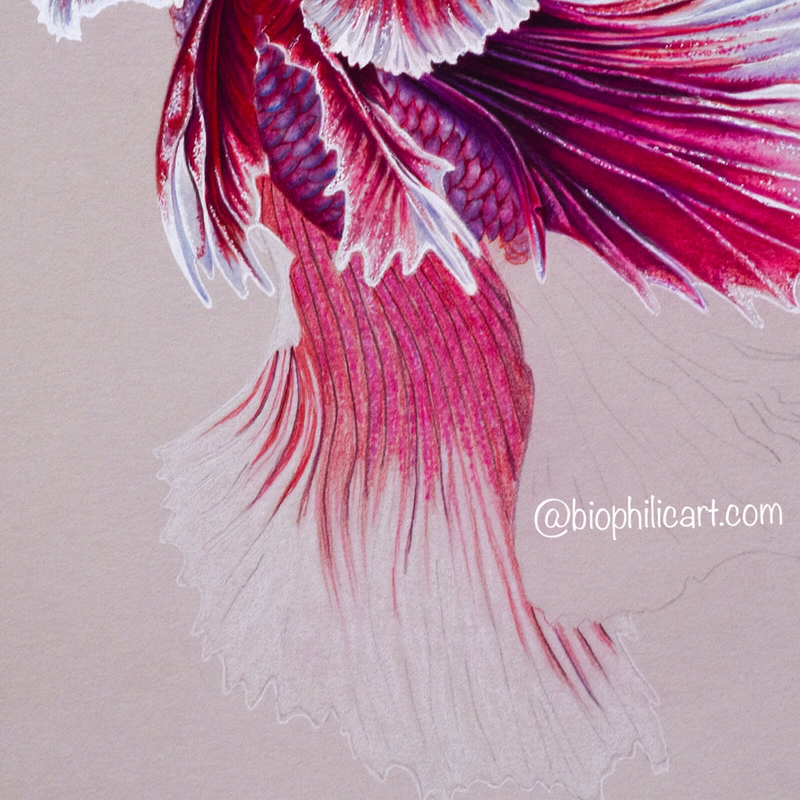 I have used no blenders at all on these fins, the blending and burnishing is done solely with the pencils themselves. Picture 1 shows the first layer. I have lightly sketched in the basic outlines using Polychromos Red Violet. This just helps me to see where the darkest lines go and maps out the drawing for me. 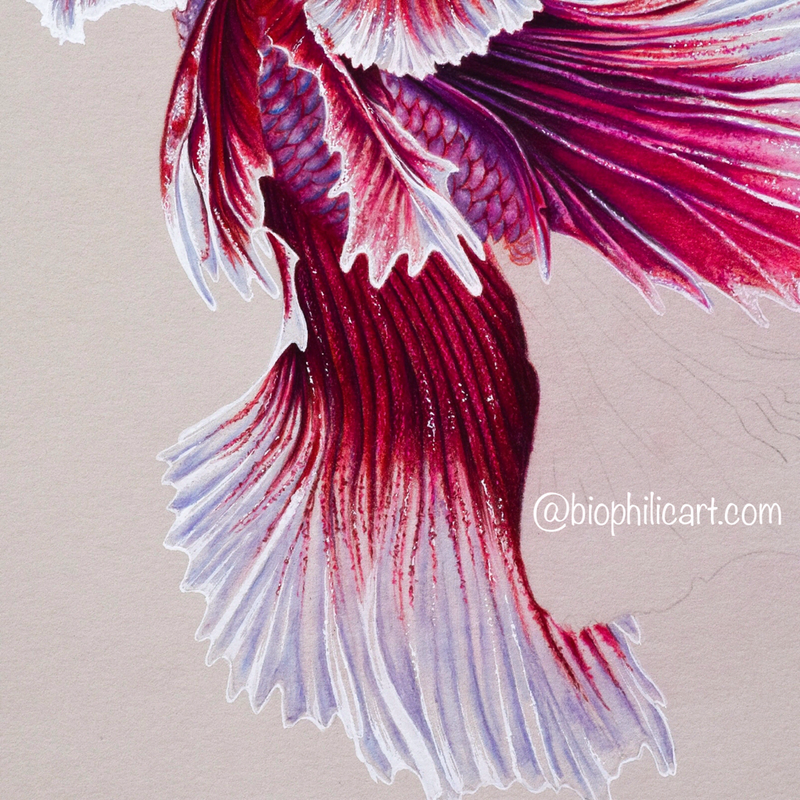 I then work little dots to represent scales on each fin segment using Caran D'Ache Luminance White and Prismacolor Ultramarine Pink. I have used these pencils because their waxier texture resists the pencils l use next quite well. I then outline each dot using Caran D'Ache Pablos in Ruby Red. Picture 2 shows the second layer, this layer starts to build the main colours and the shadows. 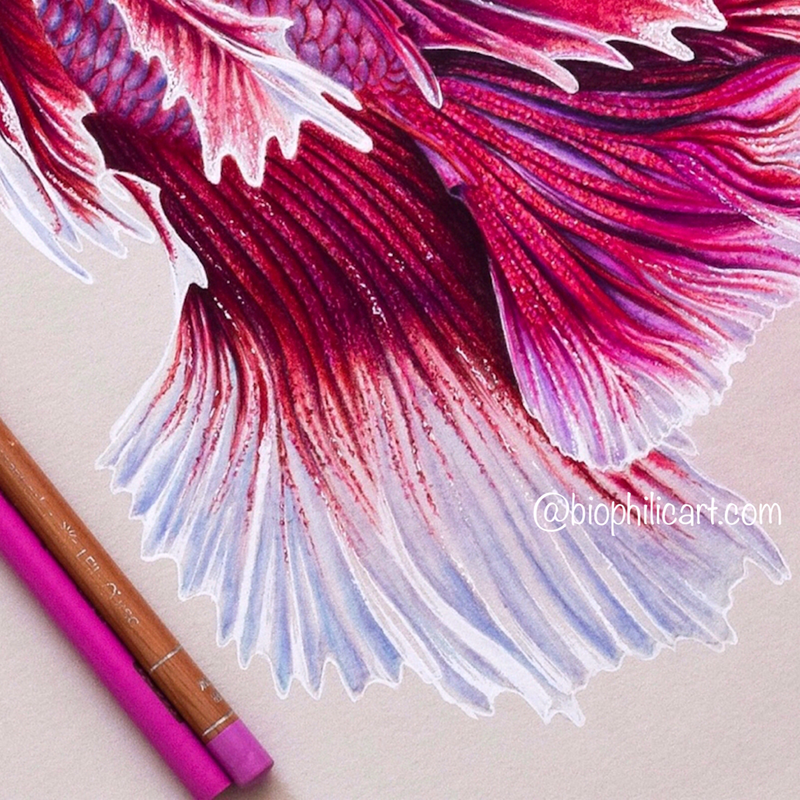 Here l have used Faber Castell Polychromos in Pink Carmine, Deep Red, Burnt Carmine and Magenta and Caran D'Ache Luminance in Crimson Aubergine. I add these colors as my eyes pick them out on the reference photo, using the darker ones to build shadow and the lighter ones to add depth of color. I also use Luminance in Light Cobalt to start to pull out the shadows in the white part in of the fins. Picture 3 l start to really build depth, l add Caran D'Ache Luminance in Ultramarine Violet and Violet to the white shadows and Luminance Crimson Aubergine and Purplish Red to the darker shadows. I take a Prismacolor Hot Pink and work over some new of the dots to pull them back out again and work around parts of the dots again in Polychromos Dark Red to give more depth to the texture. I then look at my reference photo and use Polychromos Black sparingly to really add depth to the very darkest parts. 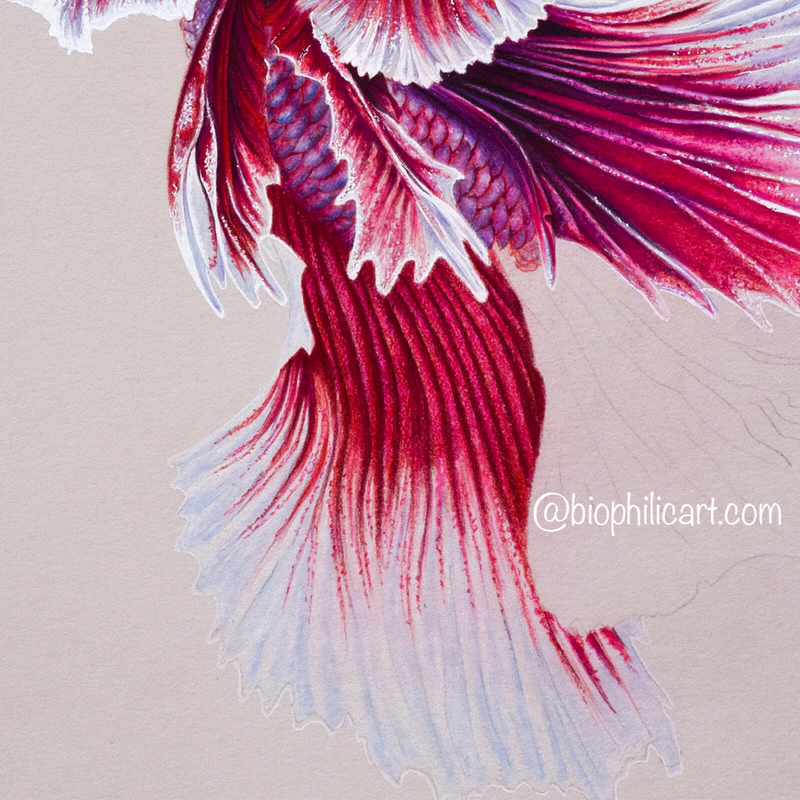 At this point l stop work on this fin until l have completed the drawing. I can then see better what l need to adjust to really finish the piece. Picture 4 shows the fin from the completed piece. I added more of the darkest shades already used to create more shadow and l worked on the white parts of the fin with Pablos Turquoise Blue and Luminance Light Cobalt, Ultramarine Violet and Violet to get more depth into those parts. Finally l pulled out tiny highlights with Copic white ink.